In 2003, a book was published by Andreas Augustin simply called "The Strand Yangon". At the newly renovated bar he asked me what it was like staying there at the faded beauty years ago. The opening of the Suez Canal in 1869 made travel to Asia far easier and thousands of miles shorter. It was the age of opulent travel, steamer trunks and servants. 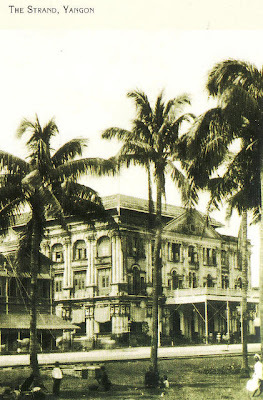 The Sarkis brothers had already opened the Raffles in Singapore and the Eastern-Oriental in Penang. 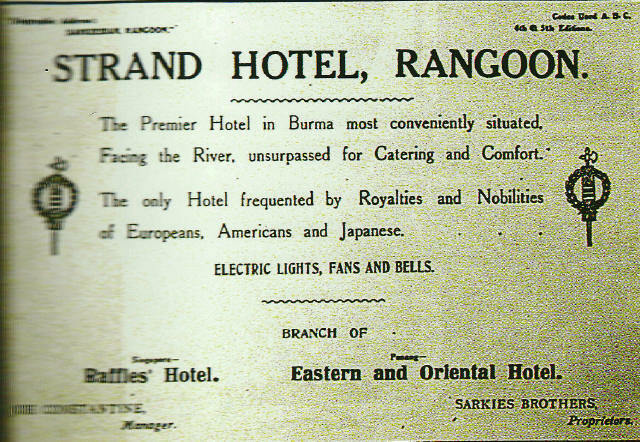 They were to open the Strand in Rangoon 1901. When I first stayed there in the early 1980's the Strand was entered through a thick beat-up side door just down the street from the Military Intelligence building. A well worn check-in desk polished by the historical elbows of the wealthy welcomed me. A telephone operator in a tight patterned sarong sat behind pulling out and plugging in red and black wires from the antique switchboard. The lobby was paved with black and white marble squares, all that was missing were the chessmen. Overhead fans swirled with wooden blades the size of which flew Lindburg over the Atlantic. 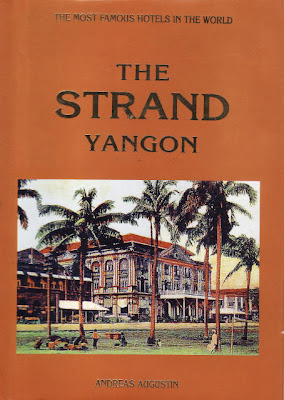 At the long solid mahogany bar with local rum and gin, Mandalay Beer was served by dark Indian waiters in frayed collars and waxy scented oiled hair. You could feel the ghosts of gentlemen and elegantly dressed women from bygone era. 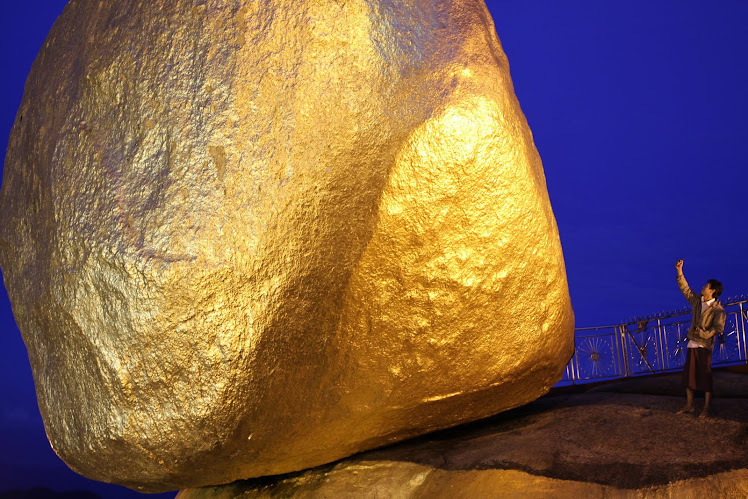 Across the empty lobby was an Otis elevator made of polished brass piloted by a smiling midget, standing well below the levers, controlling by hand where the car stopped , sliding the grate open and closed, usually a foot higher or lower than the actual floor you intended. Legions of arrogant bats flew down the hallways and the occasional rat lurked in the shadows watching which room you were checked into for further reference. The room itself had a Victorian desk and chair. Each of the legs on your bed stood in a powdery mound of deathly bug killer to insure the creepy crawlies didn't scurry up and sleep with you. On one wall a framed mirror hung with a spiderweb of black, missing the reflective silver, in front of which you swiveled your head enabling you to see only portions of your whole face. The bathroom had a rain shower as big as a dinner plate, where if the water by chance did flow it was intermittently either cold or scalding hot but always without fail, a rusty orange. The toilet had a pull cord with a tank of water overhead. A room was about $25 dollars and the sheets smelled of tropical mold and the last sweat drenched occupants. The best food in town was served downstairs. The restaurant cooked huge lobster thermidor whose tails and legs spilled over the edges of your dish for $3 dollars. Some of the most intense days of my occupancy were during the uprising of March1988. Sitting in my recessed window sill looking through the old swirly glass on to Strand Road below, across from the jetty and the Rangoon River, tanks occasionally rolled by and dozens of canvas covered trucks carrying young soldiers hefting ancient machine guns, G-2's and G-3's, jumped from the back and fired down the street at protesters who scrambled through clouds of tear gas to avoid getting shot. Many were shot. Here at night was a major capital city in a country the size of France, standing silent, no movement, vacated, deserted, eerie. In the morning, I was greeted by the leathery doorman, "Good morning sir", as if all were just peaches and walked out into the street which was congested with hustlers, skimmers, scammers and shammers. The only market as usual was the black market.There were gem dealers, antique steelers, pineapple peelers, and money changers all desperate, hovering around watching, waiting, steeped in crimes and intrigue. More violence was expected, people were in the streets, angry. Spies were everywhere, who was who? Who was watching you? I don't know, I would never know, but the eyes would burn like lasers. I hit the streets with discretion and tried to avoid the expected uprising. Shortly after this any foreigners still in the country left voluntarily or were dispelled. Martial law and the curfew would be declared in June 1988. 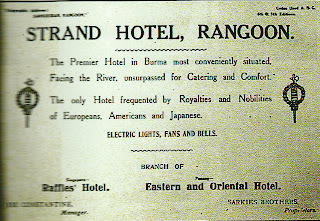 Soon Burma closed its doors to the world. The Grande Dame was left completely vacant of guests until 1989 when I along with a trickle of foreigners on group tours were once again allowed into the country and into the hotel to breathe her musty history.